Artist and educator Sharon Bertram graduates this summer from MA Fine Art Digital at Camberwell College of Arts with a powerful final work that focuses on amplifying the voices of young, black women. We Need to Talk, an installation including a wall piece featuring porcelain lip sculptures lit from behind by slowly changing LED coloured lights as well as documentation of work by several young women who have worked with the artist, originated from conversations the artist had with black women where she invited them to discuss themes of identity and culture while making – in this instance, using ceramics. Bertram grew up in Peckham and actually first studied at Camberwell 20 years ago when she completed a BA in Graphic Design. She went on to have a successful career in design and in the gaming industry where, when she started, she was the only female designer in an office of men. 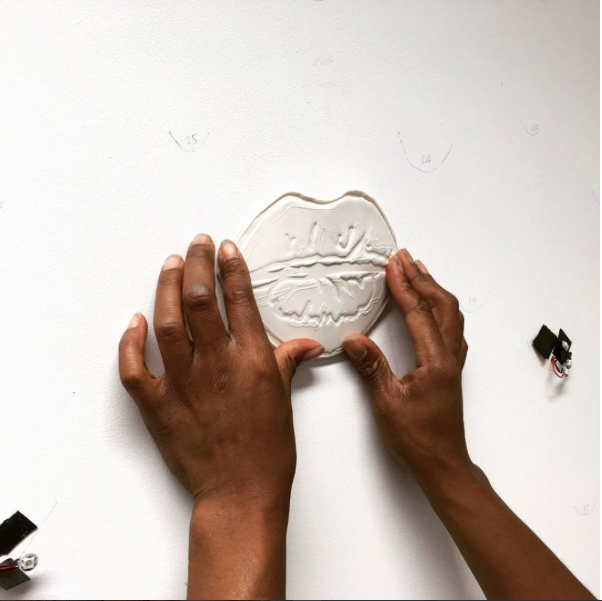 She is now an educator in south London, and her experiences of first accessing creative education have a big influence on her work. “For those students who are focused on art, it’s important that they have something to relate to” she explains. Another of her works, Navel, explores a more person exploration of the link between her identity and her ancestry. In this piece, her own navel is shown as surrounded by pigmentation in the shape of Africa. For Bertram, this is a central place, as was her naval when she was pregnant with her children. It represents her concerns about she she would ensure her children would have a cultural link with her family history and ancestry. 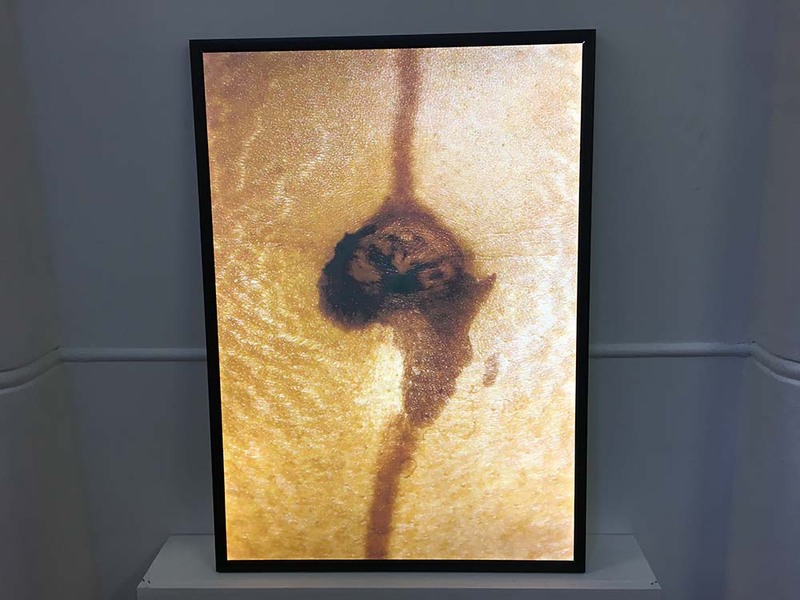 This is a key concern of Bertram’s work: the cultural heritage of passing on meanings and messages, often through storytelling, combined with shining a light on young aspiring artists and helping them to find new ways to communicate their identities. Indeed, when she explains how she talked to the young women about how to draw lips, she describes the process as “Mountain, mountain, horizon, lake: the mountains represent life’s climbs towards aspirations, the horizon represents the goal that lies ahead and the lake the wealth of information and culture that came before us”. You can see We Need to Talk at the Camberwell MA Summer Show 2017 which runs until 19 July 2017. 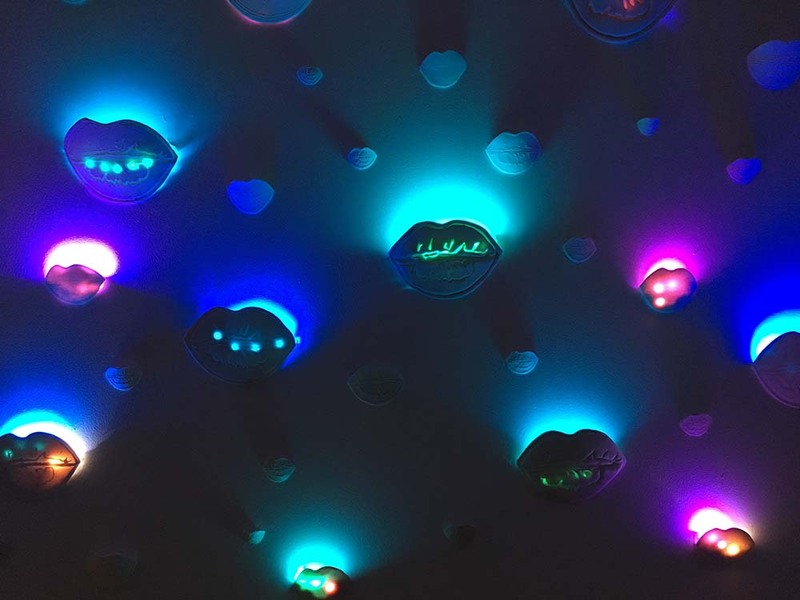 Installation shot of ceramic lips lit with LED lights from We Need to Talk by Sharon Bertram. Sharon installing We Need to Talk.